What is the best way to improve your chess results? Memorizing an opening encyclopaedia, learning endgame theory, solving puzzle positions ... there must be an easier way. How about making the most of your existing talent? In a new and enlarged edition of a highly popular work, John Nunn helps you to do precisely that. Drawing upon more than three decades of experience, he provides advice that will help players of all standards, playing styles and temperaments to achieve improved results. His methods take into account psychological factors and are firmly based on good common sense and the objectivity that has made John Nunn one of the world's favourite writers on chess. This new enlarged edition (published 2007) contains 45% more material than the first edition, published nine years ago. 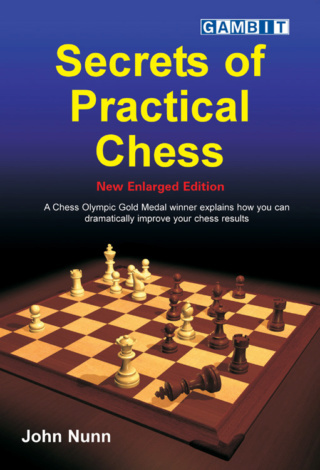 It includes a greatly expanded section on chess computers, and how their use can assist over-the-board players in opening preparation. Dr John Nunn is one of the best-respected figures in world chess. He was among the world's leading grandmasters for nearly twenty years, winning four gold medals in chess Olympiads and finishing sixth overall in the World Cup in 1989. He is a much-acclaimed writer, whose works have won 'Book of the Year' awards in several countries. In 2004, 2007 and 2010 Nunn was crowned World Chess Solving Champion, ahead of many former champions. "First rate instruction for the amateur player. Highly recommended." - INSIDE CHESS Magazine. thank you man, thats awesome! Thank you jiri,a thousand time.